Ask A Cranston MARKET EXPERT! DESCRIPTION Luxury at it's finest! This home has been upgraded in every way starting with the hardwood floors & solid core, 3 panel doors! This home was built by Vintage Fine Homes. With over 3700 sq ft of developed space, quality and attention to detail are obvious. Dining room has a pass through to Butler's pantry. Main floor den is right by entrance. 1/2 bath and back hall with laundry lead to garage. Gourmet kitchen has everything for the discerning cook. Large island, pantry and gas cooktop area are only some of the amazing features. Breakfast nook and great room are part of this open plan. Master bedroom and luxurious ensuite and master walk-in closet complete this main floor. Walk out basement has fantastic rec area with family room, pool table area and room for games table. The amazing bar includes ice maker, fridge & D/W. Custom home theater a +. 2 other bdrms, bathroom & lots of storage as well! kinetico system, dechlorinator & central vac. 3rd garage bay converted to home office. Slab heating in garage. 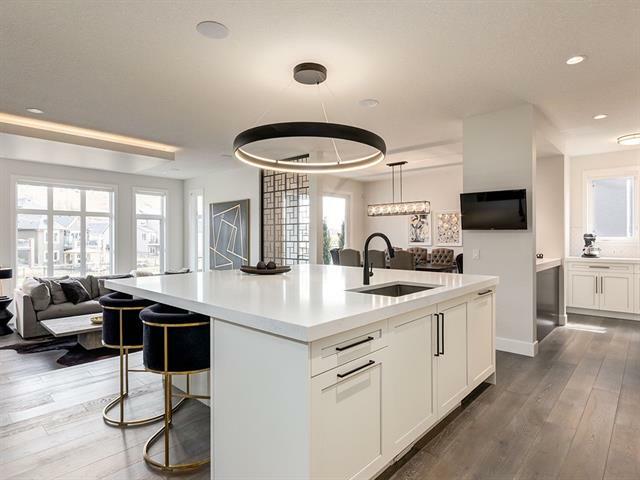 58 Cranridge Ht Se, Calgary, Alberta, MLS® C4221542 T3M 0E7 is a Detached, 3 bedrooms, 3 bathrooms, approximately 2,013 Sq. Ft. Listing price 1,449,000.00. This property was built in 2009.